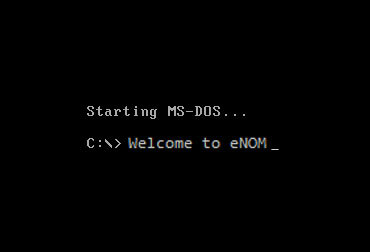 No more MS-DOS at eNom. A brand new eNom portal is being rolled out today, and the changes will be visible. Not only will the logo and color scheme change, there are underlying improvements going to the core of the aged domain registrar’s operations. “Our new logo isn’t just spiffy, with an angled “e” to make it trendy and hip,” said eNom visual communications director, Jerry Peexul. “The color scheme, the navigation, everything you see from now on at eNom.com has been carefully designed for a faster, smoother, more reliable operation,” added Peexul. Our research shows that eNom’s back-end software used Microsoft MS-DOS to facilitate important functions that required speed. While the system was optimized for core operations, such as account pushes, it could only perform them between accounts with names that were 8 characters or less. This inherent system restriction caused a lot of headaches, naturally, and in such cases domains were being pushed by hand. “The redundancy of MS-DOS is now gone, and our customers will enjoy full 256-bit compatibility, 2048-bit encrypted algorithms and domain transfers will be spectacularly fast,” said Jerry Peexul. Get ready to view the updated eNom today, or if you cannot wait, visit their reseller page. NameCheap : No love for Tucows?